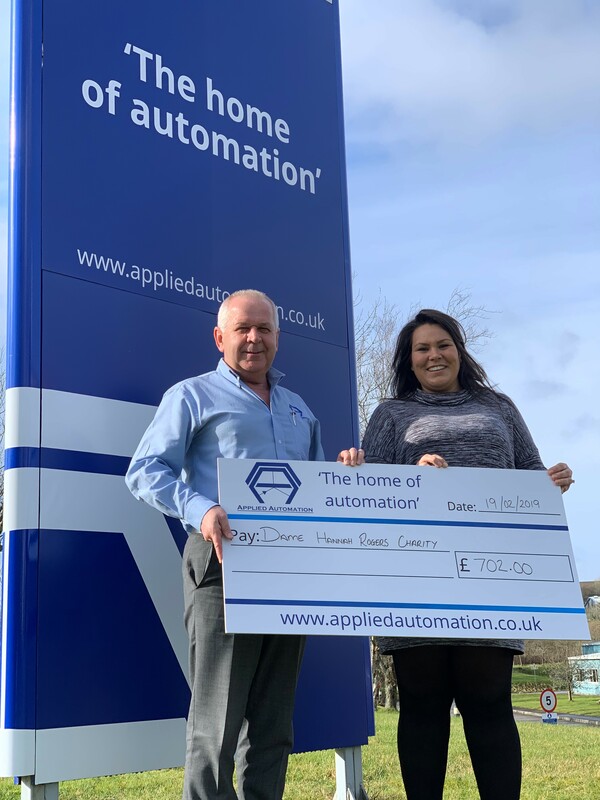 After a year of fundraising, a cheque was handed over to Hannahs by Applied Automation (UK) Ltd’s managing director, David Rowe. Hannahs is a locally-based charity, previously known as Dame Hannah Rogers and was the nominated charity for Applied Automation during 2018. Hannahs exists to help and enrich the lives of children and adults who have disabilities. Daniel Burke, head of fundraising for Hannahs said: “We’re incredibly grateful to the staff at Applied Automation for all of their support during 2018. We were delighted that staff helped Dame Hannahs to raise vital funds through buying raffle tickets, signing up to our skydive challenge, organising a raffle and joining us at the Devon County Show to do bucket collections. We’d also like to thank David Rowe for the donations received from his birthday celebration. In total £702 was raised from a variety of activities undertaken by staff throughout the year. To learn more about Hannahs, visit http://www.discoverhannahs.org/.